The National Student Clearinghouse generates education insights each year on the long-term, postsecondary education outcomes of your high school’s graduates. For your school to turn data that drives action to improve outcomes, you need to know how to interpret each chart from your StudentTracker for High Schools’ report. In this blog series, we’re decoding StudentTracker for High Schools’ most important charts and graphs – so you can use the data with confidence. Attending college is one thing. Completing college and earning a degree is something else. The StudentTracker report shows the percentage of your high school’s graduates who earned a college degree (two-year or four-year) within six years of their high school graduation. These outcomes are calculated at the six-year mark, so the most recent cohort for your school will be those who graduated six full years ago. Like other StudentTracker for High Schools’ reports, this graph can be customized with more specific information, including college type (public/private), level (2 year/4 year), and location (in-state/out-of-state). 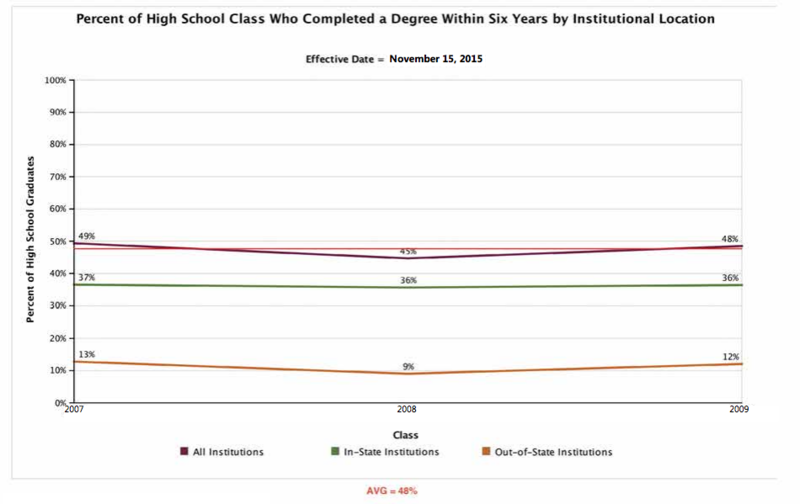 Each of the years listed along the bottom of the graph corresponds to one graduating class. In this example, we have data starting with the Class of 2007 (on the left) and ending with the Class of 2009 (on the right). Let’s look at some graduating class examples. This report shows the percentage of your high school’s graduates who earned a college degree (two-year or four-year) within six years of their high school graduation. Discover how StudentTracker for High Schools Helps Fulfill Every Student Succeeds Act (ESSA) requirements.